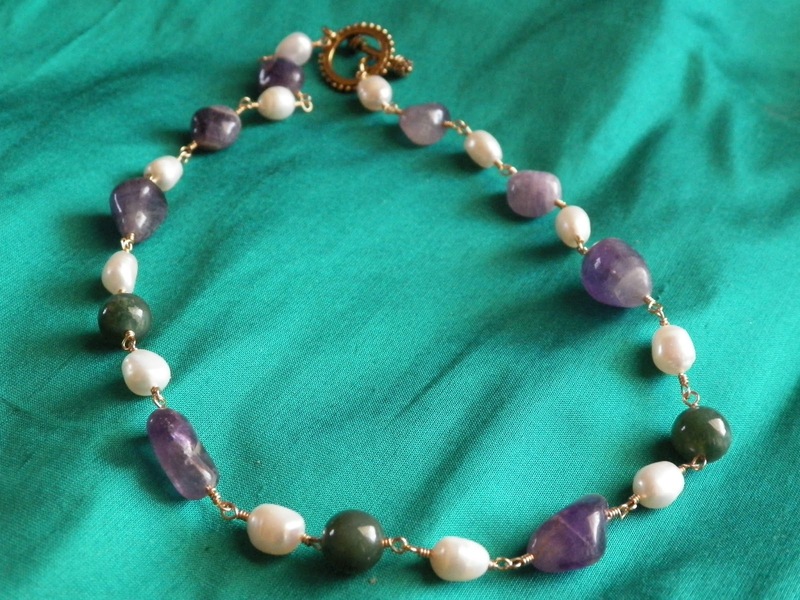 I found some gorgeous amethyst a few days ago that I’m using in an interpretation of the Gallo-Roman necklace. The original piece uses emeralds, according to the Louvre, but emeralds are a bit cost-prohibitive right now, and amethyst is found world-wide. There is even a variant of amethyst that’s called rose de France, which is a rather light shade of purple. Now, the amethyst I have is emphatically not this shade of purple, but this is where I’m going to be a bit more creative and take a few more liberties with the process. The larger pieces of amethyst are from my veritable hoard of amethyst, and it pairs decently well with the darker purple of the smaller pieces. At the same time, I’ve finished another piece – the bead-along piece. It will be headed off to its owner soon (my friend Anna, of Anna’s Rome). You might notice the change in the green materials – I found some agate or bloodstone (I can’t remember which it is) and used this as my emeralds still have not been recovered. I find it interesting the simplicity of this single strand between locations in the time-space continuum, but at the same time, the similarity of materials only affirms the Roman aesthetic and use of colour between cultures. It is utterly fascinating to me. So, back to the Gallo-Roman piece: it’s very nearly complete. 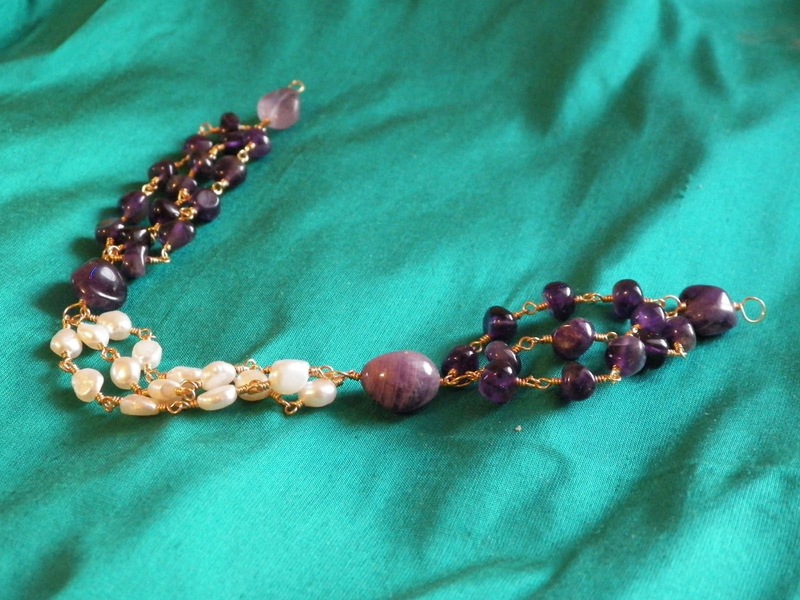 I will need to do another set of the freshwater pearls, and then another set of the amethyst, and then I’ll have to figure out what I’m going to do about the clasp, as I haven’t found an acceptably-shaped bead yet. If needed, I may see what I can do about getting some Precious Metal Clay in gold, and make two leaf/blade-shaped beads to put on wire and to use as the clasp. This entry was posted in amethyst, Byzantine, Gallo-Roman, jewellery, jewelry, necklace, necklaces, Roman and tagged beads, brag page, byzantine, byzantium, calontir, gallo-roman, jewellery, jewelry, roman, society for creative anachronism, wire. Bookmark the permalink.